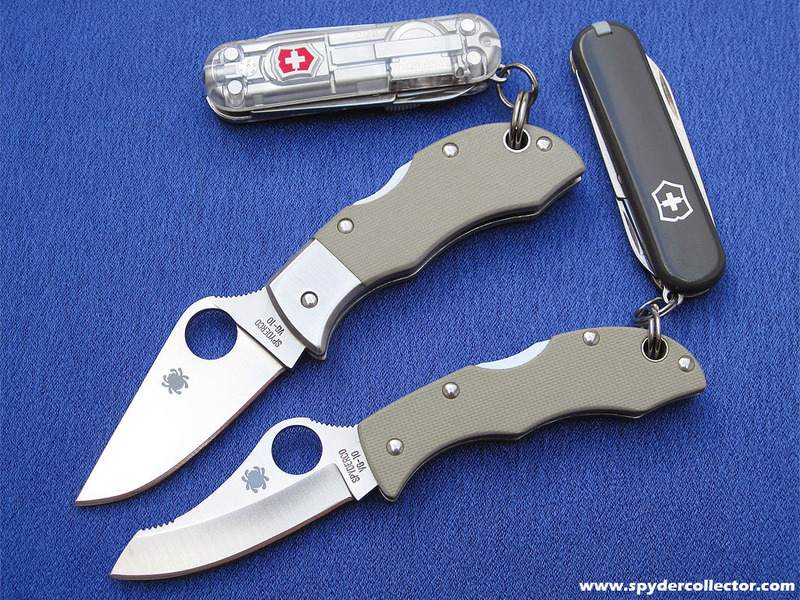 Spyderco is making some fine premium keychain knives these days, like this sprint runt grey G10 Jester and regular production G10 Manbug. They are almost too nice to put on you keychain. 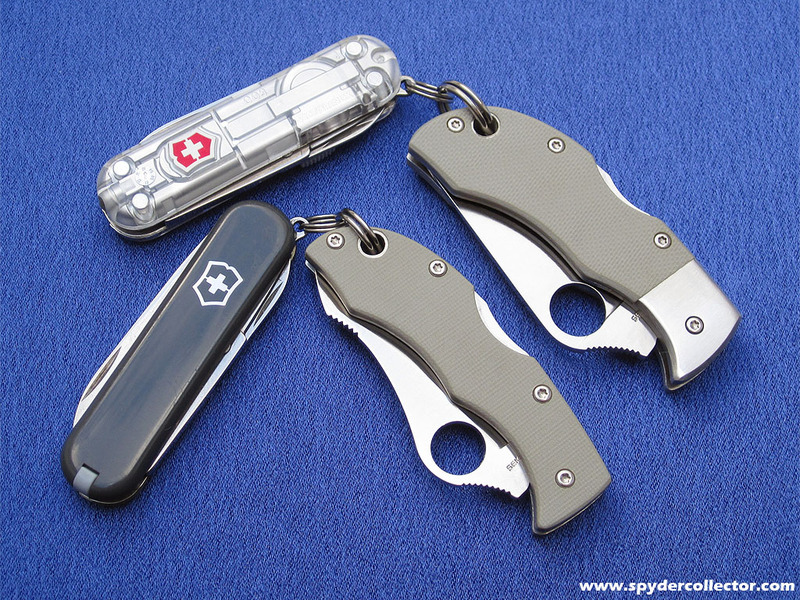 Lucky for me, I don’t put them on my keychain I put them on a Victorinox Classic and carry them in my watch pocket. I highly recommend this knife/tool combo. This ‘watch pocket tool combo’ has worked very well for me over the past ten years. When 9/11 caused security checkpoints and a fear of anything edged to spread like wildfire, I had to find an alternative to the Spyderco Ladybug on my keychain. I figured I would simply combine my other bladed keychain tool with my Spyderco Ladybug and carry it in the watch pocket of my pants. That way I can easily take off any blades I carry and never forget it’s on my keychain. After going through many micro-multitools, I settled on the Victorinox Classic. I settled on the Victorinox Classic and similar models, because they contain all the tools I could possibly need in an average day (and even many non-average days). It is a very compact and carry-friendly tool. I don’t need pliers or a can opener in my pocket, but on many occasions I have needed tweezers, a toothpick, nail file and scissors. I also like the fact that these tiny Swiss tools complement the grip of the Ladybug/Manbug like it was made for my hands. They are also very affordable and they come in many colors and variations. The blade length on the Jester and Manbug is identical, but both micro-folders ‘feel’ completely different. The thicker Manbug easily feels like it is more of a ‘real knife’ than the lightweight Jester. They both cut equally well so far. Not that this means much coming from me. I consider the Ladybug/Jester/Manbug as back-up folders to my primary utility folder, or when I need to use a knife in front of some hostile non-knife people (NKP). These small cutters are only used to cut the occasional thread or opening a package etc… So these little knives don’t see much actual use in my collection, I do carry one every day and feel naked without them though. And if I had to, I wouldn’t mind having to use a Manbug & Victorinox combo as my only pocketknife. This entry was posted on Sunday, October 21st, 2012 at 5:45 pm and is filed under Carry Folders, News. You can follow any responses to this entry through the RSS 2.0 feed. You can leave a response, or trackback from your own site. This is a really cool idea Wouter! I like the idea of using the SAK as an ergonomic extension. The Manbug has intrigued me for a while now – this post might have been enough to push me over the edge.